Available at your favorite online retailers this month, the Fourth Edition of Preferred Stock Investing includes my latest research and updated charts and examples using real preferred stocks. Preferred Stock Investing is one of the highest reader-rated books available at Amazon and sells within the top 2% of all book titles in the United States. Look for your copy of Preferred Stock Investing, Fourth Edition at your favorite online retailer this month. Special Note: Some retailers replace their inventory faster than others. Be sure you are buying the new Fourth Edition. The book's publisher, BookLocker.com, always has the current edition on sale before others. On June 2 Moody's announced that it may be downgrading the senior debt of three Big Banks - Wells Fargo, Bank of America and Citi. Such announcements frequently have the effect of lowering the market prices of preferred stocks issued by the companies under consideration, tempting buyers. 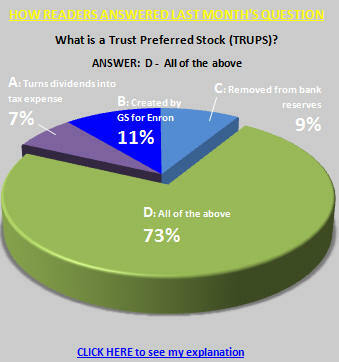 While the Moody's announcement may, in fact, deliver some great prices for the Big Bank Trust Preferred Stocks (TRUPS) issued by these banks, it also sets a trap for uninformed preferred stock buyers with respect to three specific preferred stocks. While these Big Banks currently have a variety of traditional and trust preferred stocks trading, there are three specific issues from two of these banks that carry a special risk, a trap for preferred stock buyers created by the combination of the Wall Street Reform Act (signed into law in July 2010) and the June 2 Moody's announcement. The Wall Street Reform Act changed the formula of a key bank reserve metric called "Tier 1 Capital." Historically, TRUPS issued by Big Banks (assets greater than $15 billion) have counted toward a bank's Tier 1 Capital reserves but the Act changed that. Effective January 1, 2013 Big Banks will no longer be able to count the value of their TRUPS toward Tier 1 Capital; traditional preferred stocks yes, TRUPS no. Normally Big Bank TRUPS are not callable for five years after they are first introduced. However, to protect themselves from such a formula change, Big Banks have included a standard provision in the prospectuses of their TRUPS for many years stating that if the government changes the Tier 1 Capital reserve formula the bank is allowed to prematurely call (buy back from shareholders at $25 per share) the TRUPS issue, as long as they do so within 90 days of the change or the announcement of the change. The Wall Street Reform Act, as soon as it was signed into law, constituted such a change. At that point last July, Big Banks had 90 days to execute a premature call of their TRUPS but only one of them (Comerica) managed to get their marbles in a row fast enough and do so. In late October 2010 the 90 day window closed, protecting preferred stock investors from premature calls of their Big Bank TRUPS - except for eight specific Big Bank TRUPS issues. There are eight high quality TRUPS where the issuing Big Bank omitted the 90 day limitation language from the prospectus. That means that these eight Big Bank TRUPS, listed in Table 1, are callable at any time (please note that to protect the values of subscriptions to the CDx3 Notification Service, my preferred stock email alert and research newsletter service, trading symbols have been obscured here). Until May 18 this list included nine Big Bank TRUPS but during May we had a case where one was actually prematurely called. You can read about the case of FTB-C from Fifth Third, called two years prior to its official call date, on the Preferred Stock Investing Reader's Forum. FTB-C will now be redeemed by Fifth Third on June 15, 2011 (instead of the official call date of May 15, 2013) and all shareholders will receive $25 per share on that date. What do you think happens to the market price of a TRUPS (or any other preferred stock) when the issuing company announces that it will be calling it? It moves toward $25, of course, since that is what shareholders receive from the issuing company in the event of a call. For example, when Fifth Third called FTB-C on May 18 its market price dropped by $1.48 per share, falling from $26.68 to $25.20 by the end of the day. If the issuing bank of any of these eight Big Bank TRUPS announces a premature call of any of these issues, which they can do at any time since the key 90 day limitation language was omitted from their prospectuses, preferred stock investors who paid more than $25 per share will be in for a capital loss (look at the Last Price column on Table 1; with one exception, the uninformed buyers of the world are paying more than $25 for these shares right now). It is for this reason that Preferred Stock Investing encourages preferred stock buyers to avoid paying more than $25 when you make your purchases. By always paying less than $25 per share, you position yourself for a nice capital gain and avoid the risk of a capital loss entirely in the event of a call (premature or otherwise). Of the eight Big Bank TRUPS that have omitted the 90 day limitation language and can therefore be called at any time, three (highlighted in yellow on Table 1) are issued by the same banks that are the subject of the Moody's announcement for potential downgrade. Think about what that means for uninformed preferred stock buyers. If Moody's goes ahead with a downgrade the market prices of these three Big Bank TRUPS will start to fall. Uninformed buyers will purchase these securities (all above $25 per share) having been lured in by what will seem like great prices. These buyers will then realize a capital loss if/when the issuing bank exercises their right to prematurely call the security since shareholders receive $25 per share in the event of a call. The underpublicized right to prematurely call these three Big Bank TRUPS is the trap; the trigger is the pending Moody's downgrades and the resulting falling market prices that will result are the bait. The June 2 Moody's announcement, combined with the provisions of the Wall Street Reform Act, has created a situation where unsuspecting preferred stock buyers who are willing to pay more than $25 per share to chase yields are entering a trap with these three specific Big Bank TRUPS in the event of another premature call. If you have followed the preferred stock investing method described throughout Preferred Stock Investing and in these CDx3 Newsletters each month and have avoided paying more than $25 per share for your preferred stocks, then you have nothing to concern yourself with here. You are in for a nice capital gain, on top of the great dividend income that you have been earning, in the event of a call (premature or otherwise). But if you have purchased shares of Big Bank TRUPS for more than $25 per share you do not want to learn the same hard lesson that many holders of FTB-C learned last month. To see if your Big Bank TRUPS can be prematurely called you can either subscribe to the CDx3 Notification Service where these Big Bank TRUPS are listed in the current issue of the subscriber's newsletter, CDx3 Research Notes (page 2) and posted on the CDx3 Discussion Group, or check the prospectus for each Big Bank TRUPS that your own. 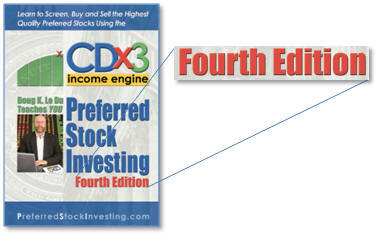 Whether you subscribe to the CDx3 Notification Service (take a tour of the all new Version 4 subscriber's website, implemented during April 2011) or go it alone, if you own shares of a Big Bank TRUPS that you paid more than $25 per share for you may be exposed to a surprise capital loss right now since eight of these popular securities are callable at any time. One way or the other, please do not wait until a premature call is announced to find out if you are at risk. Preferred Stock Investing includes the information, websites and other resources needed for you to be a very successful preferred stock investor. The new Fourth Edition of the book will be available at online retailers this month. For those who would rather someone else do the research and calculations, I offer the CDx3 Notification Service. Subscribers to the CDx3 Notification Service receive an email alert when there are buying and selling opportunities coming up. Subscribers also receive their own non-promotional preferred stock research newsletter every month, have their own website that hosts the CDx3 Preferred Stock Catalog and have access to the CDx3 Discussion Group, the only online forum just for preferred stock investors. (Already a subscriber? For symbols, check out page 2 of the current issue of the subscriber's newsletter, CDx3 Research Notes). The Big Bank Trust Preferred Stock (TRUPS) opportunity first reported to you here in July 2010 is starting to come to fruition as our Big Banks are starting to take action in order to comply with the provisions of the Wall Street Reform Act. Triggered by the 2010 Wall Street Reform Act, there are actually three opportunities here for preferred stock investors. And it is not too late to participate as the five Big Bank TRUPS listed in this table illustrate (note that in order to protect the value of subscriptions to the CDx3 Notification Service, my preferred stock email alert and research newsletter service, trading symbols are not provided here. But this is real data gathered on May 31). On May 18, 2011 Fifth Third announced that it will be calling its Series C TRUPS (FTB-C). This premature call created quite a stir since it occurred two years prior to FTB-C's official call date. Even though Fifth Third was able to execute this call under the terms of FTB-C's prospectus, preferred stock investors who paid more than $25 per share were caught off guard. On June 15, 2011 FTB-C shareholders will receive $25 per share from Fifth Third. Those following the preferred stock investing method described throughout my book, Preferred Stock Investing, knew to purchase shares for less than $25 per share. The book not only instructs preferred stock investors to avoid purchasing shares above $25 but also uses the Rule of Buyer/Seller Behavior (Preferred Stock Investing, chapter 3) to help preferred stock investors determine when to do so. According to the Rule of Buyer/Seller Behavior, the market price of a preferred stock will tend to most favor buyers at the beginning of a dividend quarter (the ex-dividend date) when it is furthest away from its next quarterly dividend payday. Take a look at this chart. 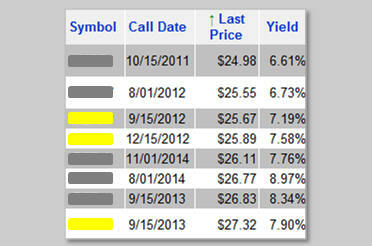 This is the market price history of FTB-C while it was trading for less than $25 per share (prior to January 20, 2010). The yellow x's mark the first day of each dividend quarter, the day that Preferred Stock Investing says tends to most favor buyers. When FTB-C shareholders receive their $25 per share in cash from Fifth Third on June 15, 2011, those following the CDx3 Income Engine method described throughout Preferred Stock Investing will be piling a capital gain on top of the great dividend income that FTB-C has been providing. Their purchase price and effective annual return is shown for each purchase date shown on the chart. FTB-C's declared dividend rate (coupon) is 8.875% but, as you can see here, following the CDx3 Income Engine method of purchasing at a point in time that tends to favor buyers can provide much higher returns. FTC-C provides us with our first example of the effective annual returns earned by preferred stock investors using a Big Bank TRUPS called in response to the Wall Street Reform Act (while BB&T announced in April that they would be calling their Big Bank TRUPS under the Act as well, BB&T did not say exactly when they would do so and has yet to). Fifth Third is a $11 billion regional bank founded in 1862 and headquartered in Cincinnati, Ohio. The bank has $111 billion in assets from its four main businesses: Commercial banking, Branch Banking, Consumer Lending and Investment Advisors. Fifth Third weathered the Global Credit Crisis better than many and returned to profitability in 2010, generating over $750 million in net income for the year. After paying $350 million in dividends to U.S. taxpayers, the bank also redeemed its TARP preferred stocks in February 2011 by issuing $1.7 billion in new common stock plus $1 billion in new bonds. The chart here is from FITB's 2010 Annual Report To Shareholders and shows Total Shareholder Return (dividends plus common stock appreciation) from last year compared to the S&P 500 and the S&P Banks Index. 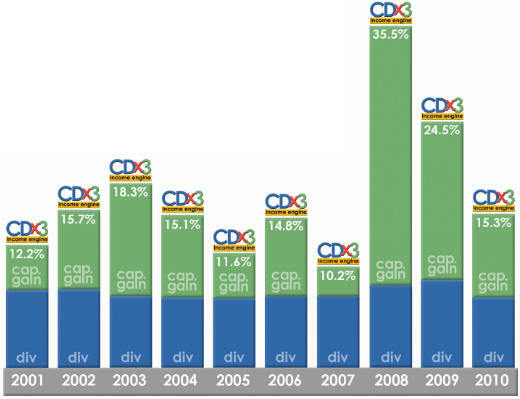 As described in the Special Announcement article above, Fifth Third was the first Big Bank to deliver on the Big Bank TRUPS opportunity that has been described in every issue of the CDx3 Newsletter since July 2010. They did so by calling their 8.875% trust preferred stock FTB-C for June 15, 2011. Several things were unique about how FITB went about calling FTB-C. First, as explained in the Special Announcement article above and on the Preferred Stock Investing Reader's Forum, FTB-C was called two years prior to its official call date using a very rare prospectus provision. Secondly, where companies usually issue a new preferred stock or bond in order to generate the cash they need to execute a preferred stock call, FITB is buying back FTB-C shares on June 15, 2011 using $400,000,000 in excess cash. And thirdly (and this may be unique in the preferred stock world), FITB is reimbursing the losses of investors who purchased shares of FTB-C before the news that the security was being called could be fully distributed. As described in the above Last Month's CDx3 Results article, FTB-C's market price started to drop from near $27 to near $25 the minute that FITB made the May 18 announcement that it was calling FTB-C. But the word did not get around to every investor in the world at the same time. Buyers that day, seeing what they thought to be a bargain price, snapped up shares while the price was dropping only to find out later that better informed sellers had taken advantage of them. These buyers, all paying more than $25 per share, realized an instant capital loss on their investment. So in an incredibly unusual step, FITB is going to reimburse those losses as explained in FITB's May 25 press release. Uneven communication is a perplexing problem that other Big Banks are going to have to figure out how to avoid since in this case it cost FITB an additional $1.5 million to reimburse uninformed buyers. Learn more about Fifth Third Bancorp: Company website | Profile | Upgrades/Downgrades | Recent News. What is a 'capital treatment event'? As important as a security's prospectus is, the fact is that very few individual investors read them. These documents are written by lawyers, for lawyers much more so than for regular people trying to earn more than 1% on their savings. The prospectus explains (in what is admittedly difficult to read language) the various obligations of the issuing company to potential buyers of the security. For preferred stocks, the prospectus will explain the obvious arrangements such as the dividend payment schedule and amount, what you are entitled to if the company skips a dividend payment, whether or not interest will be due to you against any skipped amounts, and so on. Other important topics will include the timing and process for the company to buy your shares back from you. Most commonly the issuing company regains the right to buy your shares back from you, at $25 per share, five years after the security is introduced (the call date). Some preferred stocks also have a maturity date. The maturity of a preferred stock is essentially a forced call since shareholders will receive $25 per share from the issuing company on the maturity date of a preferred stock (although many investors ignore maturity dates since they are usually set decades into the future). But there are other rare events that can trigger a call as well and these can vary for different industries. One such event is referred to as a "capital treatment event." The question this month for preferred stock investors: What is a 'capital treatment event'? (A) The circus tent covering applied to a state's capital building when fighting a termite infestation. (B) A point in time when you determine that a word's first letter should, in fact, be Capitalized. (C) A change to the way a bank's Tier 1 Capital reserves are calculated as invoked by a recognized authority. The correct answer to this question is (C), a change to the way a bank's Tier 1 Capital reserves are calculated as invoked by a recognized authority. Banks are required to keep a certain amount of their capital in reserve in case of some type of disaster. The formula for Tier 1 Capital, a way of measuring bank reserves closely watched by bank regulators, is set by the U.S. government. The formula defines how banks are to treat their capital with respect to measuring reserves. Changes to the treatment of a bank's capital as it relates to the Tier 1 Capital metric is referred to as a "capital treatment event" in preferred stock prospectus language, especially bank-issued trust preferred stocks (TRUPS). While there are a few rare exceptions (see Table 1 in the Last Month's CDx3 Investor Results article above) common TRUPS prospectus language says that the bank can prematurely redeem (call) the TRUPS shares within 90 days from the date of either an announcement of a capital treatment event or the actual implementation of such an event. That creates two 90 day windows of opportunity within which the bank is allowed to prematurely call their TRUPS. Let's take a look at the actual prospectus language of a real bank-issued trust preferred stock as it relates to a capital treatment event (shortened for presentation here). "...prior to [the call date], at any time within 90 days of the occurrence of a...capital treatment event...[the bank] may redeem the [TRUPS], in whole but not in part..."
"A capital treatment event means [the bank]’s reasonable determination that, as a result of the occurrence of any amendment to, or change (including any announced prospective change) in, the laws (or any rules or regulations thereunder) of the United States or any political subdivision thereof or therein, or as a result of any official or administrative pronouncement or action or judicial decision interpreting or applying such laws, rules or regulations, which amendment or change is effective or which pronouncement, action or decision is announced on or after the date of issuance of the Trust Preferred Securities, there is more than an insubstantial risk that [the bank] will not be entitled to treat an amount equal to the aggregate liquidation amount of the Trust Preferred Securities as Tier 1 capital..."
Once the Wall Street Reform Act was signed into law on July 21, 2010, the U.S. government was essentially announcing that it would be changing the Tier 1 Capital formula. The actual change happens on January 1, 2013. 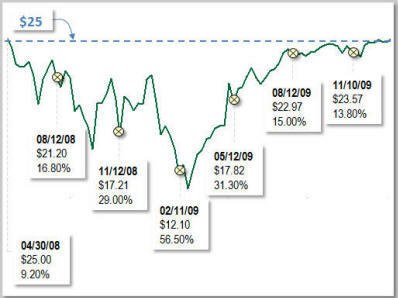 These two dates (the signature on July 21, 2010 and the implementation on January 1, 2013) are important to preferred stock investors since both generally qualify as "capital treatment events" as seen in the above example. For Big Bank TRUPS that include these common provisions, the first 90 day window of opportunity for the bank to prematurely call its TRUPS, triggered by the signing of the Act, closed on October 19, 2010 so is no longer of any concern. The second window opens on January 1, 2013 so expect some Big Bank TRUPS to be called within 90 days of that date. Will Moody's Pull The Trigger? As has been explained in every issue of this CDx3 Newsletter since July 2010, the Wall Street Reform Act provided a significant opportunity for preferred stock investors buying shares of high quality Big Bank TRUPS for less than $25 per share. Last month, Fifth Third was the first to deliver on that opportunity by calling FTB-C for June 15, 2011. This call provides investors following the preferred stock investing method described throughout Preferred Stock Investing with effective annual returns well north of 10% on their Big Bank TRUPS investment (see chart in the Special Announcement article above). Over the coming weeks Moody's is going to conduct its announced downgrade analysis of senior debt from Wells Fargo, Bank of America and Citi. In the event that actual downgrades are issued you may very well see a dip in the market prices of these Big Bank's preferred stocks. Be very careful here. Many buyers will be tempted to jump at prices still above $25 but low enough to look like real bargains. Paying more than $25 per share can result in a capital loss if you happen to purchase shares of one of the eight Big Bank TRUPS that are callable at any time since the banks omitted the key 90 day limitation language from these prospectuses. Some Big Bank TRUPS include the 90 day limitation language (preventing a premature call until January 1, 2013) while others do not. Position yourself for a capital gain by always paying less than $25 per share. But if you feel that it is in your best interest to pay more than $25, do so with the lights on. Either subscribe to the CDx3 Notification Service for a list of the eight high quality Big Bank TRUPS that can be prematurely called or figure it out on your own before you invest. Either way, avoid paying more than $25 per share for a Big Bank TRUPS that can prematurely called regardless of bargain prices that any Moody's downgrades may bring your way.